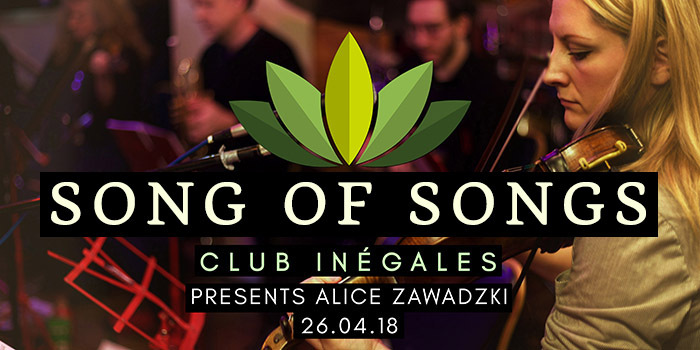 Club Inégales's Spring/Summer season places its focus firmly on the voice. Peter Wiegold and his band, Notes Inégales, will be joined by a number of vocalists. Jazz singer Alice Zawadzki will be joining them for the first concert, on 26 April 2018. The ensemble first performed with Alice at their London Jazz Festival marathons last November, and she will be featuring in three concerts in the season, returning to perform with Rob Luft (guitar) and with Chris Sharkey (guitar), both of whom played with the ensemble in November. Also in the season will be singer Merit Ariane Stephanos and qanun-player Nilufar Habibian, performing Aramaic chant and Sephardic songs, as well original material, as well as Jenni Roditi's The Improvisers’ Choir (TIC) which recently won the Nonclassical Battle of the Bands.